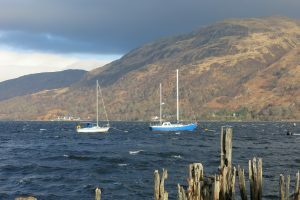 A wet and windy week but we did manage a celebratory trip up the Loch toward to end of the week! Also an interesting and successful diving charter in the Sound of Mull, divers don’t mind the rain. The weather continues to be very changeable and difficult to accurately predict so look out for changes or give us a call and tell us where you would like to go. Monday 24th: Half day Loch Etive trip 10am departure places available, ring Chris to book. Tuesday 25th: Currently all trips available, ring us to discuss options. Wednesday 26th: All trips possible, where will you go? Friday 28th: Half Day Loch Etive trip, 10am departure. Saturday 29th: Sorry NO trips today. Sunday 30th: Sorry NO trips available. Fab weather helped to make last weeks Easter trips really memorable. Wonderful scenery with lots of wildlife sightings, especially seals, and some chocolate eggs! Tuesday 23rd: All trips available, ring Chris to discuss. Wednesday 24th: 2 hours Creags trip, 10am departure. Thursday 25th: Provisional half day Loch Etive, 10am start. Friday 26th: All trips available. Saturday 27th: Private Charter. Sorry NO trips today. Looking for 2 more to do our Creags or Kerrera trip tomorrow, Easter Monday. See website for trip details.